Pay Interest on Your Salary? Imagine receiving your monthly salary and then paying your employer interest on it, even though it’s money earned, not money borrowed. Sounds nonsensical? OK. Now imagine that because all digital and paper money in circulation, including your salary, is actually a pile of I.O.U.s, i.e., loaned money, interest must be paid on it and you have to pay your share. How can it be “debt money” and how would you have to pay the interest on it? Indebted for Good, But Not for Any Good Reason? Critiques of such Federal Reserve debt money, such as the 2009 award-winning documentary “The Secret of Oz” (the sequel to the earlier “The Money Masters”) explain it this way: Understand that, apart from coins in circulation, the U.S. money supply comprises account demand deposits and other money equivalents of varying liquidity, and that, with the exception of coins that have component metal value and paper bills in circulation, much of that money is created out of thin air. This is “money” in the form of digital displays, ink smudges or pieces of printed and signed bond paper) as Federal Reserve “fiat money”—money created by decree, but nonetheless as interest-bearing treasury bills and bonds sold to the Fed for the Fed-created fiat money, including the paper currency we call “Federal Reserve notes” and digitally deposited funds provided to banks. The Treasury issues are then sold by the Fed with a promise of interest to the buyer, including foreign governments. Hence, the interest paid is on created money “lent” without risk by the Fed (despite the “collateralization” of the fiat money by Fed assets that presumably include Treasury bonds bought with fiat money—and, some critics allege, U.S. natural landmarks sites, such as national park and heritage sites, used as collateral in the event of a default). Since the Fed fiat money is swapped for bonds of equivalent value, interest must be paid to their purchasers, the bond holders—foreign and domestic. Now, imagine—rather, understand—that your salary is taxed to help pay that interest, reported to be more than $454 billion in 2011 or about $1,440 per capita in that year alone, and only as interest, leaving the principal (the “national debt”) untouched. 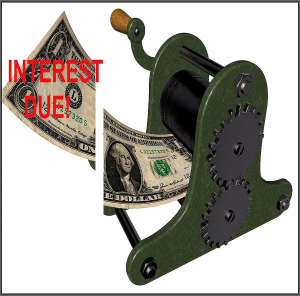 Amazingly, the critics argue, if all money in circulation were removed to “pay off the debt”, the interest on it would remain to be paid, necessitating “borrowing” even more money from the Fed or whatever central banking cartel is authorized to create interest-bearing money. That the Fed hands over most—not all—of the interest back to the Treasury does not reduce the impact on the taxpaying interest-payer. Moreover, it is reasonable to ask whether, at any time between receipt of this interest and remitting it to the Treasury, it can be utilized for short-term investment of the funds or at least for earlier settlement of Fed debts (with reduced interest to be paid to third parties). (Note: Besides the expense of its “operating costs”, the Fed reportedly is obliged to pay its private member banks a mandated and fixed 6% dividend on the “stock” these banks hold. Yes, private banks. These, the critics say, are the facts. So, they would say, forget imagining any of this—it is, they maintain, all very real. So, their logic suggests, you end up paying interest on your salary—even if not to your employer and even though you haven’t borrowed your salary from anyone. Your Taxes Cover Only the Interest? One oft-voiced criticism of this interest-bearing fiat money is the claim that not a single dime of federal personal income tax is spent on creating assets in the form of roads, schools, medical centers or social services, any other infrastructure or transfer payments. Instead, it is argued, all of the tax revenues are spent as paid interest on fiat money created and lent without risk. However, an in-depth analysis by Jonathan R. Siegel, Professor of Law and Davis Research Professor at George Washington University, counter-claims that this is a myth: Professor Siegel characterizes that story as, at best, an exaggeration. What Makes Real Loans Risky? What, by contrast with risk-free loans—i.e., risk-free for the lender, is money that is created and/or lent with risk? Well, if a gold prospector takes a chance to dig or pan, risking not only failure, but also his own assets (including time, energy, money, life and limb) to find gold, he compounds that risk by lending it to someone who may fail to repay him in gold or its accepted equivalent. Hence, interest to be paid him is a perfectly understandable “risk premium”—charged as a hedge against defaults and as compensation for other risks he took to be able to offer the gold he owns as a loan. As a more common example, consider lending part of your employment income to someone. Because you earned that money and because you would have to earn more to replace it if it were not repaid when loaned, lending it is risky to the extent that repayment default will cost you dearly if you’ve worked hard for your money and will have to work just as hard or harder to replace it. Therefore, requiring a risk premium in the form of interest is perfectly understandable and fair (depending on the rate). “That is to say, under the old way [i.e., 'borrowing' money from a private central bank like the Fed] any time we wish to add to the national wealth we are compelled to add to the national debt. People who will not turn a shovelful of dirt nor contribute a pound of material will collect more money from the United States than will the people who supply the material and do the work. That is the terrible thing about interest. In all our great bond issues the interest is always greater than the principal. All of the great public works cost more than twice the actual cost, on that account. Under the present system of doing business we simply add 120 to 150 per cent, to the stated cost. Now, government financing and monetary policy has countless hideously complex aspects—and for all I know, Edison, Ford and the Fed critics may have this all wrong. But there is one thing I am certain of. At least they have earned my interest. Update: If you are unconvinced that you are or will be paying interest on your salary, consider the warning that “negative interest rates” on bank deposits (including deposited salaries) may be on the horizon in the U.S., after reports of their having just been introduced in Europe by the European Central Bank.